MetEd » Resource Description: Weather Ready Nation: Prepare and Be Safe! 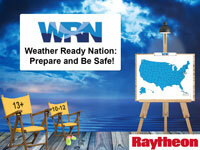 These Weather-Ready Nation (WRN) scenarios—eight in all—take about 10 minutes each to complete. The scenarios are based on potential weather events ranging from floods to heatwaves and teach safety steps individuals should take before, during and after significant weather events. Users can choose their geographic location and appropriate age group. This learning resource was developed by Raytheon as part of the National Oceanic and Atmospheric Administration’s (NOAA) Weather-Ready Nation (WRN) Ambassador™ initiative, and incorporates feedback from NOAA and the Federal Emergency Management Agency (FEMA) with hosting provided by The COMET® Program. I did this yesterday and I have to redo it again to get my certificate again???? under the same account??? Very informative, great that it is geared towards the younger generations. Identify safety and health strategies before, during and after: floods, lightning, heat waves, tornados, winter storms, hurricanes, rip currents and tsunamis.